You can buy online Windows Store credit through Windows gift cards, with which you can purchase and download applications, games and more from Windows Store on your PC with Windows 8.1 or on your mobile phone with Windows Phone 8 and even acquire titles on Xbox Live store. With over 100,000 products to choose either computer or mobile phone. In addition, these gift cards never expire, so it can be used at any time and even for a gift. Once purchased, the activation code of the Windows Store prepaid card is sent quickly and safely via email. Once purchased, we\'ll just enter code in our Microsoft account to unlock the corresponding credit, in this case is equivalent to 25€. 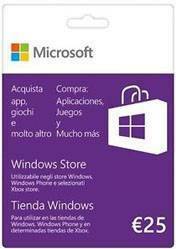 There are no comments yet about Windows Store Gift Card 25 Euro . You can be the first one! Next STEAM SALE is SOON! GTX 1660 Ti Price REVEALED!